Bhaisajyaguru (藥師佛／薬師 Ch. Yàoshī, Jp. Yakushi), more formally Bhaisajyaguruvaidūryaprabha (Jp. 薬師瑠璃光如来 Yakushirurikō nyorai) and also known as the Master of Healing or Medicine Buddha, is the Buddha of healing. His full name means «Medicine Master Lapis Lazuli Light». In Mahayana Buddhism, Bhaisajyaguru represents the healing aspect of the historical Buddha Sakyamuni. Bhaisajyaguru is described in the eponymous Bhaisajyaguru-sutra (Jp. 薬師経 Yakushi-kyō) as bodhisattva who made and fulfilled 12 vows, two of them related to healing. On achieving Buddhahood, he became the Buddha of the realm of Vaidūryanirbhāsa (Jp. 浄瑠璃 Jōruri) in the eastern quarter, where he is attended to by the bodhisattvas Nikko and Gakko. Yakushi is notably absent from the Mandala of the Two Realms, but is one of the Thirteen Buddhas. Bhaisajyaguru is typically depicted seated, wearing monk’s robes, with a blue-colored jar of medicine in his left hand and the right hand resting on his right knee, holding the stem of the aurara plant between thumb and first finger. Starting in the 7th century Yakushi has been the object of a popular cult in Japan, largely supplanting the previous cult of Ashuku (Akshobhya). Some of Yakushi’s role has been taken over by Jizo (Ksitigarbha), but Yakushi still presides over the Japanese Buddhist memorial service to dead. Tibetan Buddhists consider the Medicine Buddha Empowerment to be the most powerful blessing for healing, dispelling sickness and for awakening the innate healing wisdom that lies within every individual. 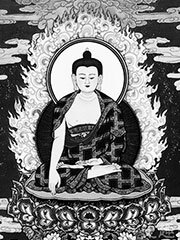 At the Shenpen Osel website (external links section) the very venerable Khenchen Thrangu Rinpoche gives a wonderful and detailed commentary on the Medicine Buddha. One will need to download «Acrobat Reader» program offered free at the site in order to use the PDF file. At their site click on Volume 4, Number 1 to download the commentaries and sadhana on the Medicine Buddha. Om Nah Moe Bah-ga-va-tay Bye-Saya-guru Vye-Dur-Yah Proba-Raja-Yah, Tata-Gata-Yah, Arh-Ha-Tay, Sam-Yak-Sam Buddha-Yah Tay-Ya-Tah Om Bay-Kah-Jay Bay-Ka-Jay Mah-Hah Bay-Kah-Jay Bay-Ka-Jay Rah-Jah Sah-Moo-gah-tay, So-hah! (Tah-yah-tah) OM, beck-and-zay beck-and-zay, mah-hah beck-and-zay beck-and-zay, rod-zah sah-moo-gah-tay, so-hah! The Medicine Buddha mantra is held to be extremely powerful for healing of physical illnesses and purification of negative karma. One form of practice based on the Medicine Buddha is done when one is striken by disease. The patient is to recite the long Medicine Buddha mantra 108 times over a glass of water. The water is now believed to be blessed by the power of the mantra and the blessing of the Medicine Buddha himself, and the patient is to drink the water. The practice should be repeated each day until the illness is cured. Tibetan Buddhism also teaches that the Medicine Buddha mantra can be used to liberate the animals one eats. The practice involves reciting the Medicine Buddha mantra and then blowing on the meat. It is held that the dead animal, wherever it has been reborn, will be liberated from its suffering and reborn into a happy existence.